Greenville Athletic Boosters Fun Night Saturday, March 23 from 6-10 p.m. at Paws Bingo in Greenville. 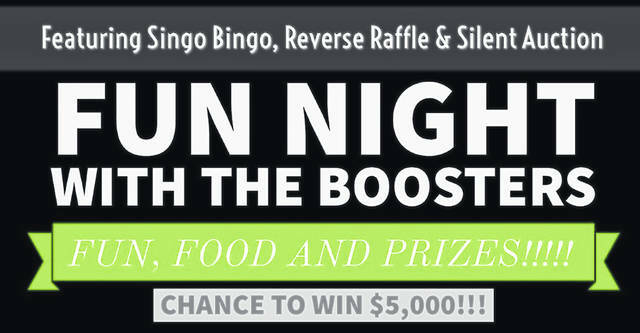 GREENVILLE – The Greenville Athletic Boosters is sponsoring a Fun Night Out with the Greenville Athletic Booster featuring Singo Bingo, Saturday, March 23 from 6-10 p.m. at Paws Bingo in Greenville. The event will also include free food, soft drinks, cash bar and music. A Reverse Raffle, with a grand prize up to $5,000 and Silent Auction with many valuable items donated by local business partners will be included. All proceeds from the night’s event will go to support Greenville sports programs. “It’s going to be a lot of fun,” added Bowman. https://www.dailyadvocate.com/wp-content/uploads/sites/34/2019/03/web1_funnight-8-inch.jpgGreenville Athletic Boosters Fun Night Saturday, March 23 from 6-10 p.m. at Paws Bingo in Greenville.